Reduce Emissions Near the Grand Canyon? Say you live on the West side of the Cascades in Oregon and you just got a brand new heat pump water heater. You know you're saving about 1,000 kilowatt-hours of energy a year, which you know is saving you money on your electric bill. Are there any other benefits? 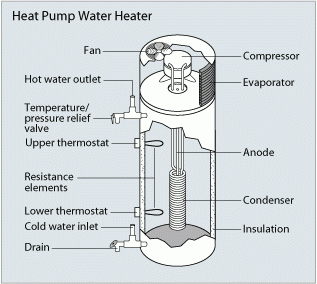 Since your heat pump water heater reduces the energy to heat your water, some power plants can produce less energy. Often those power plants emit carbon dioxide, so your efficient water heater is actually helping reduce emissions. It may seem a little far-fetched at first, so let's walk through the steps. Power system planning primarily seeks to minimize cost, not emissions. Power plants schedule generation based on which plants can operate most inexpensively to meet the expected electricity demand. Power plants fueled by sources like hydro, wind, and solar emit negligible CO2, and tend to have low operating costs. Fossil fuel generation sources like natural gas, coal, and fuel oil all emit CO2 to some extent and have higher operating costs. In general, when demand for electricity goes down, the most expensive power plants producing energy reduce generation levels. Since these are often fossil fuel generators, there is usually also a reduction in CO2 emissions. For context, an efficient natural gas-fired generator emits roughly 0.8 to 0.9 pounds of CO2 per kilowatt-hour. Less efficient natural gas units can emit nearly double, and coal plants can emit up to triple of that. In the Pacific Northwest, using one less kilowatt-hour of electricity avoids approximately 0.9 to 1.8 pounds of CO2, according to the Council's recent study. Since you're saving 1,000 kilowatt-hours annually, your efficient heat pump water heater is avoiding between 900 to 1,800 pounds of CO2 per year. The Pacific Northwest usually exports power to California. The Desert Southwest and Mountain West regions also export power to California. When the Northwest reduces its native electricity need due to energy efficiency, more Northwest generation is available to meet the electricity demand in California. Usually the generation with the most expensive operating costs in the Northwest is from efficient natural gas power plants, whereas in the Desert Southwest and Mountain West it's often from coal plants. Since California has a carbon cap-and-trade program, this often results in increased energy exports from the Northwest to California. This in turn leads to lower energy exports to California, and often, lower generation from coal units in Arizona, Nevada, Utah and Colorado. Replacing coal generation with natural gas generation is what significantly lowers the emissions. Since the power grid is just a big circuit, we can't guarantee that installing an energy efficient heat pump will reduce CO2 emissions in your backyard, or even in the Pacific Northwest. But, we do know that it will reduce CO2 emissions in general, and perhaps, even close to the Grand Canyon. Can a Heat Pump Water Heater Installed in the NW Reduce Emissions Near the Grand Canyon?